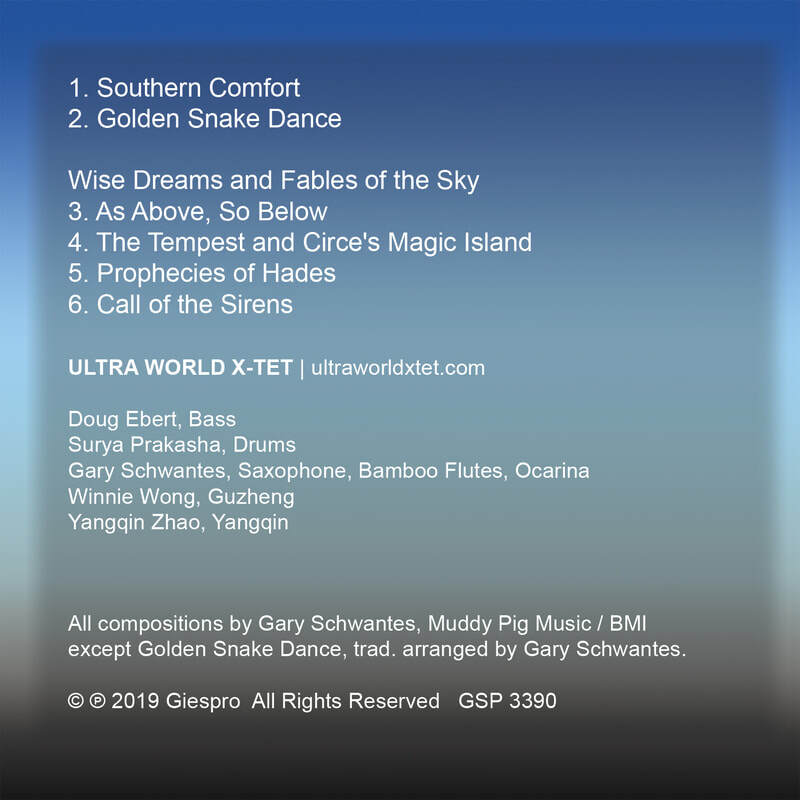 ​Wise Dreams and Fables of the Sky is Ultra World X-Tet's third and latest release. Give it a listen and you'll discover beautiful melodies, innovative compositions, compelling improvisations, and contagious grooves. The artistry of the group is unleashed with full force. Co-produced by Gary Schwantes and Jerry Stucker (Headhunters), the album begins with the bluesy feel of Southern Comfort and the driving celebratory groove of Golden Snake Dance. Those tracks set the stage for the drama and mystery of Wise Dreams and Fables of the Sky (tracks 03-06, inspired by The Odyssey). From beginning to end, the album will take you on a funky, mythical musical adventure. 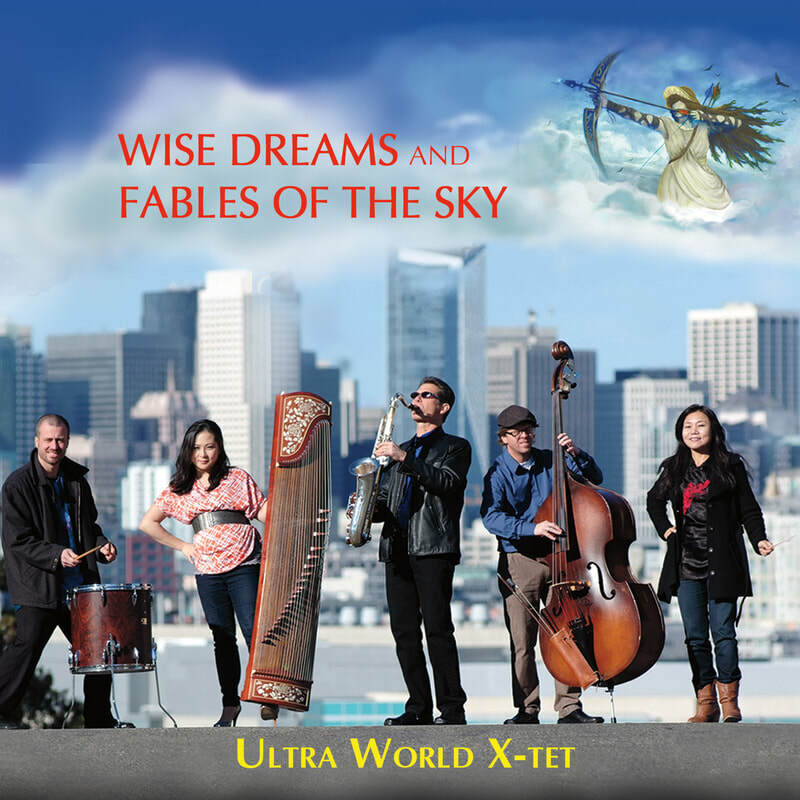 Ultra World X-Tet is based in San Francisco, where the group's performances have delighted audiences and garnered rave reviews.Their sound has been described as "psychedelic world jazz," "world fusion," "world class" and other colorful labels. Whatever you want to call it, it's exciting, it's unusual and it really works. This unique San Francisco sound with a world music flavor will transport you and fire your imagination. except Golden Snake Dance, trad. arranged by Gary Schwantes. 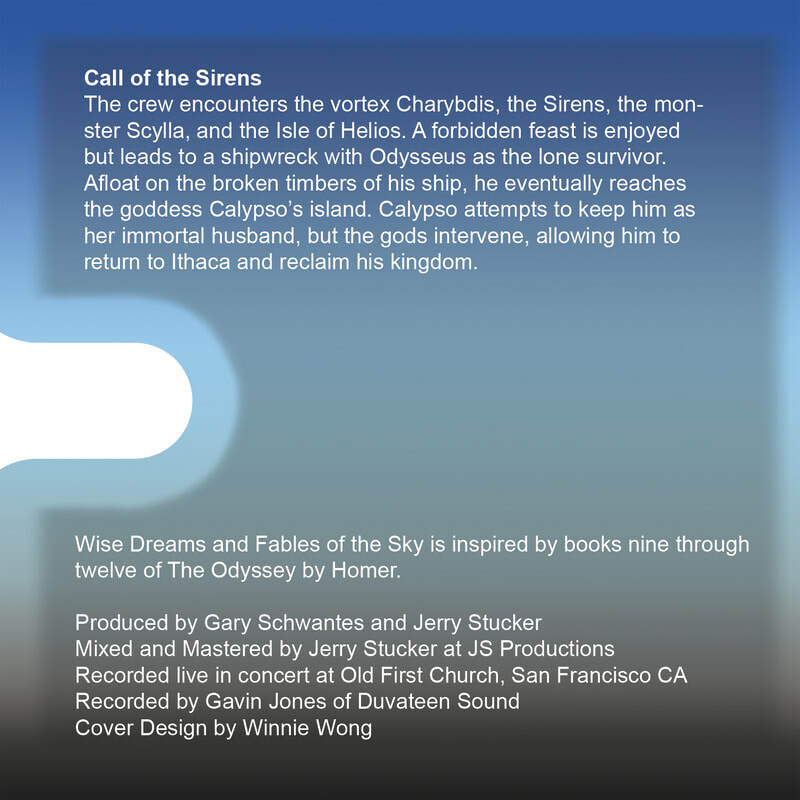 The gods watch from Olympus as Odysseus and his crew pillage, plunder and roam the seas. Zeus sends a storm as punishment. The crew drifts off course encountering the Land of the Lotus Eaters and other strange adversaries. Odysseus incurs the wrath of Poseidon by blinding his son (the giant one-eyed Cyclops) in order to escape a grisly fate. As the crew sails away, we hear the Cyclops wailing in the distance. 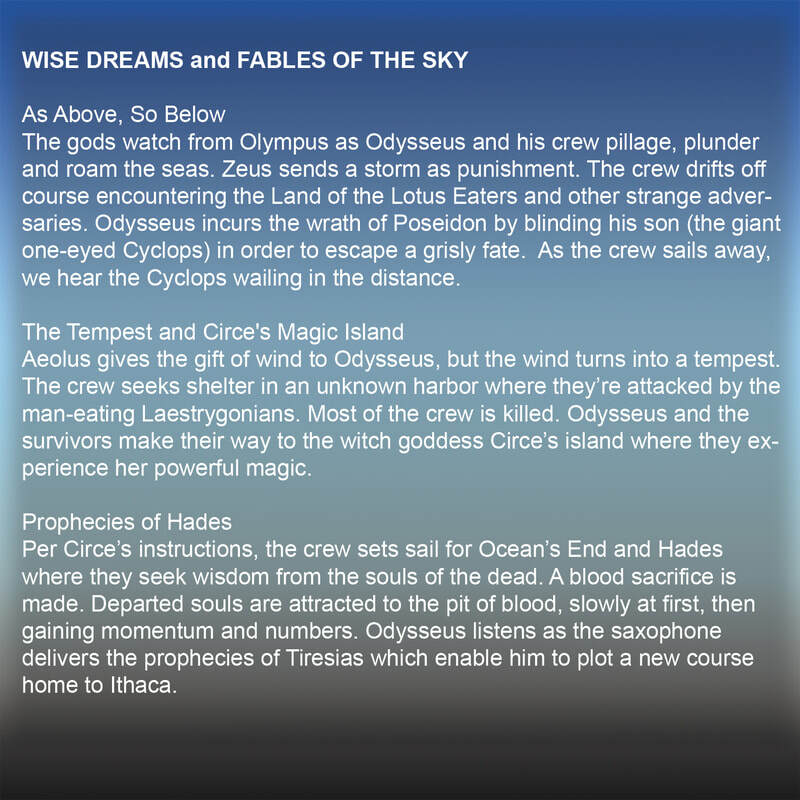 Aeolus gives the gift of wind to Odysseus, but the wind turns into a tempest. The crew seeks shelter in an unknown harbor where they’re attacked by the man-eating Laestrygonians. Most of the crew is killed. Odysseus and the survivors make their way to the witch goddess Circe’s island where they experience her powerful magic. delivers the prophecies of Tiresias which enable him to plot a new course home to Ithaca. The crew encounters the vortex Charybdis, the Sirens, the monster Scylla, and the Isle of Helios. A forbidden feast is enjoyed but leads to a shipwreck with Odysseus as the lone survivor. Afloat on the broken timbers of his ship, he eventually reaches the goddess Calypso’s island. Calypso attempts to keep him as her immortal husband, but the gods intervene, allowing him to return to Ithaca and reclaim his kingdom.